Home Forums Mechanical Turk MTurk Help & Resources So, encroaching on 1k HITs, got some questions on scripts/taxes. So, encroaching on 1k HITs, got some questions on scripts/taxes. Discussion in 'MTurk Help & Resources' started by atomicminotaur, Dec 13, 2016. I asked this on another forum, but it was ignored. So, we'll try again here. I have faith! I've been a worker since 2011, but I haven't taken it seriously until now. My plan is to shoot for $25 day, initially. Last week I did $43, but I didn't do it seriously. Heck, up until last week I had just over 500 hits since 2011. I'm now at almost 980. I only have 1 rejection. My goal today is to get to 1000 hits, for sure. I know that will help a ton. So, as far as scripts go... 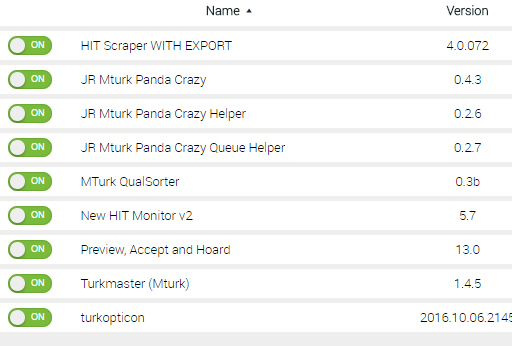 I have Turkopticon, Turkmaster, Hit Scraper, Hit Monitor, Qual Sorter, and 3 different JM Panda things, as well as a PANDA&Hoard. I've toyed with all of these, but I'm pretty much lost. I don't know what I should be inputting for Hit Scraper, or if I can weed out what I'm unqualified for and/or takes too long for the money offered... I guess the same goes for Turkmaster and Panda Crazy. Heck, I don't even know if I've got too many scripts, the right scripts, or conflicting scripts and barely use them. I get most of my HITs from /r/HWTF and the daily threads. Is there a very general how-to on these for people at a certain point in their turking adventure? Like... Ok, you have 1000 hits, here's how to get the most out of Turkmaster and Hit Scraper until 5000. I'm still reviewing script threads and how-tos as we speak. Most, however, say "install this" but not so much why, how to set it up specifically for me, or when to use them. Also, what should I be doing for income taxes? Obviously not for this year, but for next year? Should I be exporting/saving data? Will Amazon send me a 1099 or whatever? I'm going to be taking my turking very seriously, 3-5 hours a day. Thanks for reading my wall of text, and for putting up with my newbie cooties. You should finish doing that. You'll probably answer all of your own questions. You'll find tutorials and information on every script you asked about and even everything you need to know about mTurk taxes if you look through it all. You have so many questions and your settings/experience and everything is going to be different for each person. Start reading, and then if you are unsure about something you can ask in that particular thread. Ah, thank you. How the heck did I miss those stickied threads?